Sewer and drain cleaning is a job that requires the help of a professional. Stoppages can start out as a small inconvenience - first you may notice that water runs away slowly from the drain. This is the time to call Herrera Plumbing Service to arrange for a visit from a complete drain cleaning specialist. Once the drain becomes completely clogged you will likely be faced with standing water in the tub, shower or sink. Clogged drains can develop into a real plumbing emergency very quickly. Call Herrera Plumbing Service to get the problem resolved before it progresses. If you are already faced with overflowing drains or flooding in your home our professional plumbers are on call to help in an emergency. Reparacion De Plomeria En Houston Tx, Plumbing Repair In Houston Tx"
Most advanced pipeline inspection and drain cleaning technology. Herrera Plumbing Service uses the most advanced video inspection and drain clearing equipment available. This allows us to pinpoint problem areas in pipelines such as cracks and root problems. We provide video footage on DVD or VHS formats and digital stills upon request. Much more sophisticated and problem specific than "rotor rooter" systems. Don't leave this important job until its too late. Call Herrera Plumbing Service for a visit from an experienced, professional plumber. You can then face the coming storm season with complete peace of mind. 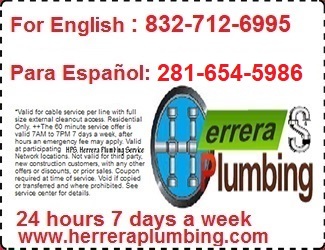 Herrera Plumbing Service, List Of Our Plumbing Services In Houston Texas And Surrounding Areas.! More advanced than "rotor rooter"
We now offer our clients the ease and efficiency of Scheduling your Appointments online. You can arrange for an expert Plumber to attend your home or business by submitting your request below. Our Plumbing Project Coordinators will get back to you in 5 minutes or less. All appointment requests/emails go directly to our office staff assuring you a "Rapid Response"